Soundbreak XP Gypsum Board is an acoustically enhanced gypsum board used in the construction of high STC wall assemblies. This innovative gypsum board allows for construction of high STC wall assemblies that are thinner, cost effective and more reliable than traditional methods for constructing these types of assemblies. SoundBreak XP Gypsum Board has an acoustically enhanced, high density gypsum core encased in a heavy, abrasion and mold/mildew/moisture resistant, 100% recycled, purple paper on both sides. 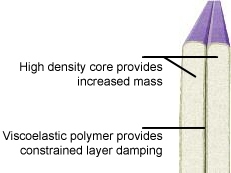 Used in construction of high rated STC wall assemblies, SoundBreak XP consists of a layer of viscoelastic damping polymer sandwiched between two pieces of high density mold resistant gypsum board, providing constrained layer damping. Use of SoundBreak XP Gypsum Board results in wall partitions with high rated STC values that are thinner than traditionally built high rated STC wall partitions providing increased usable floor space. 5/8″ SoundBreak XP features a fire resistant Type X core and is UL Classified and approved for inclusion in specific UL fire-rated designs. Increasing the stiffness of a wall partition will decrease the amount of sound transmission loss. For that reason metal studs outperform wood studs, and 24″ o.c. f raming spacing outperforms 16″ o.c. framing spacing. SoundBreak XP Gypsum Board must be stored off the ground and under cover. Sufficient risers must be used to ensure support for the entire length of the gypsum board to prevent sagging. 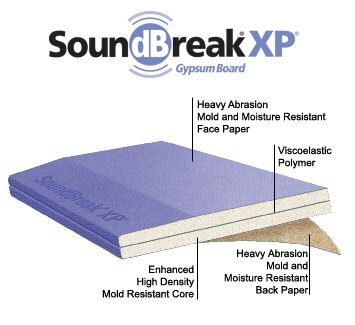 SoundBreak XP Gypsum Board must be kept dry to minimize the potential for mold growth. Adequate care should be taken while transporting, storing, applying and maintaining SoundBreak XP Gypsum Board. For additional information, refer to the Gypsum Association publication, “Guidelines for the Prevention of Mold Growth on Gypsum Board” (GA-238-03), which is available at under the “Download Free Gypsum Association Publications” section.